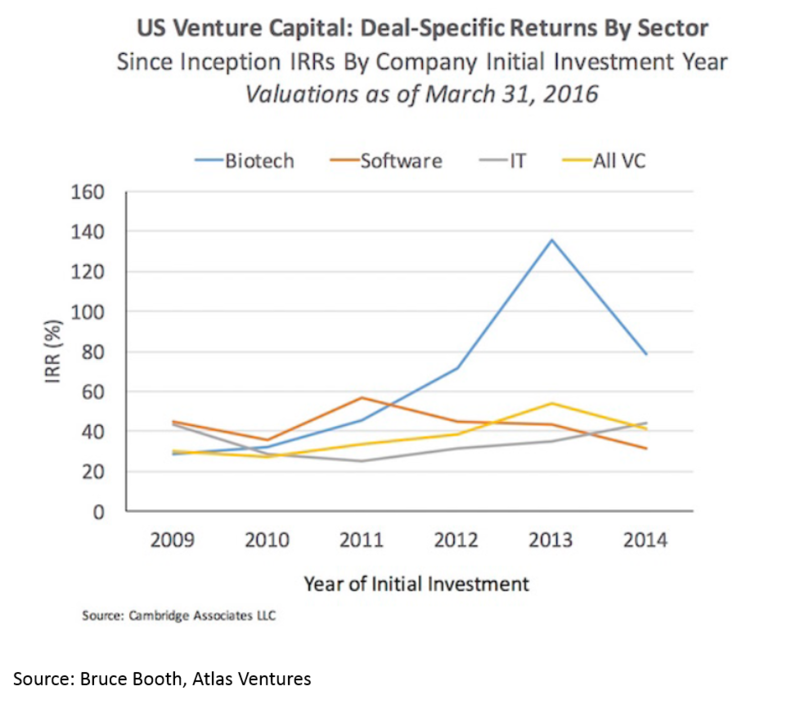 In the last few years, bio startups have enjoyed a renaissance, with more IPOs and large M&A exits than software despite getting only a fifth of venture funding. This activity has sparked a lot of interest in the space, especially from young scientists and entrepreneurs. Of all the exciting developments in bio, I think the most significant breakthrough will be the emergence of a new generation of entrepreneurs. But the industry has a steep learning curve, and there's a big gap between what's interesting in academic research and what's interesting for a company. Having a basic understanding of the industry can help aspiring founders figure out what problems to focus on, what business models to use, and where opportunities lie. In this post, I'll briefly frame the current environment for startups and then describe a few challenges facing the industry. In part 2, I'll try to describe how startups are addressing these issues, and point out some areas where there may be room for more new companies. For more background on why now is a good time to start a bio company, I wrote another post on that topic. I'll focus primarily on therapeutics (FDA-regulated prescription drugs to treat disease) here. Most investment in bio goes to therapeutics companies (rather than diagnostics, outsourced services, etc), and the biopharma industry is one of the largest in healthcare. 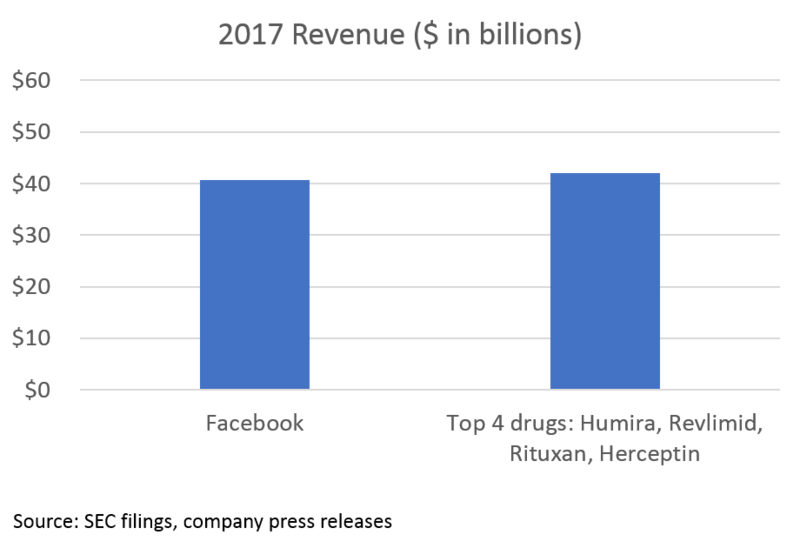 Biopharma (biopharma = drug development) has been one of the most profitable areas for startups in the last five years. In 2017, $12B was invested into biopharma startups, and in just the first 4 months of 2018 over $5B has been invested into startups. It seems like we are in the early innings of the era of bio decacorns. For more on why, you can read this post I wrote earlier this year. The opportunity in biopharma all stems from the massive value created by blockbuster drugs. While pricing is a major issue (and beyond the scope of this post), the value of these drugs (at least in theory) is determined by how much they improve human health. 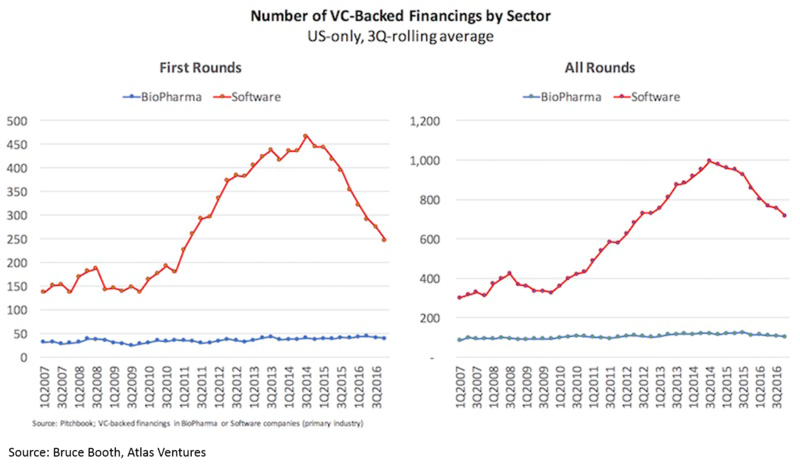 Despite these fantastic returns and the massive influx of capital, the number of new funded biopharma startups has not increased in 10 years. Takeaways: 1) this supply / demand imbalance makes now the best time ever to start a bio company and 2) for any new technology related to biology, chemistry, and even other “hard tech” from physics to AI, drug development is one of the most attractive initial markets for your technology. Eroom’s Law (Moore’s Law backwards) states that the costs of getting a drug approved by FDA have been increasing exponentially over time. The result of this is that most drug research now focuses on a handful of diseases (see next figure) where cost of development is lower (and there are fewer cheap generics available), and research in other disease areas has dried up. Takeaway: reducing the cost of drug development is the biggest problem (and opportunity) facing the $600B drug industry 1. It is an existential problem. Where does R&D money go? The good news: we're investing a ton in cancer research. The bad news: we are largely ignoring all other major causes of death 2. Heart disease is the leading cause of death in the United States, but receives comparatively little R&D investment. Cerebrovascular disease and Alzheimer's are also significant causes of mortality that have received few new drugs. Alzheimer's is the only top ten cause of death with no treatments to prevent, cure or treat the underlying cause of disease. Alzheimer's will only continue to grow as a cause of death, but to date our understanding of the disease's biology has prevented us from developing new drugs. There is a lot of venture and government money going into Alzheimer's, however, and hopefully it will bear fruit. But perhaps the biggest failing of our drug development efforts is in mental health. It may not be readily apparent in the chart above, but mental illness causes about as many lost years before age 75 as heart disease and over five times as many as diabetes. This shows up in the chart in the "suicide" and "unintentional injuries" categories. 90% of suicides are related to mental illness, and there are more deaths in the U.S. each year from suicide than from breast cancer (for what it's worth, Herceptin, one of the top-selling drugs from Figure 2, treats breast cancer). More than half of the lost years before age 75 in the "unintentional injuries" category are related to poisoning, most commonly meaning drug overdose. The unmet need is clear, but there is very little pharma or venture investment in mental illness or addiction these days. We don't understand the brain very well, and based on what we do understand about it, it is very difficult to treat the causes of brain disease with our current biochem toolkit. Before moving on, it's worth mentioning a category of disease that does not explicitly show up in the above charts (it is hidden in the "other" category) but is up there with cancer in terms of R&D investment: rare disease (also called "orphan" disease). These are essentially diseases with fewer than 200,000 patients in the U.S. Because they individually are so rare, they don't show up as leading causes of death, but as a whole they cause more lost years before age 75 than diabetes 3. Over 40% of new drugs approved in 2017 were for orphan diseases. Orphan disease research receives significant funding from pharma and venture capitalists. There are 30M people in the U.S. with rare diseases, and an estimated 350M worldwide. Roughly 50% of these rare disease patients are children, and 30% of these children will not live to see their fifth birthday. Rare diseases account for 35% of deaths in the first year of life (here's the source for all that data). The progress being made in treating rare diseases is something to celebrate, although this progress is not without issues (pricing and access for rare disease drugs are particularly thorny). Why does R&D money go where it does? So why is so much money invested in cancer and rare disease research, but in little else? 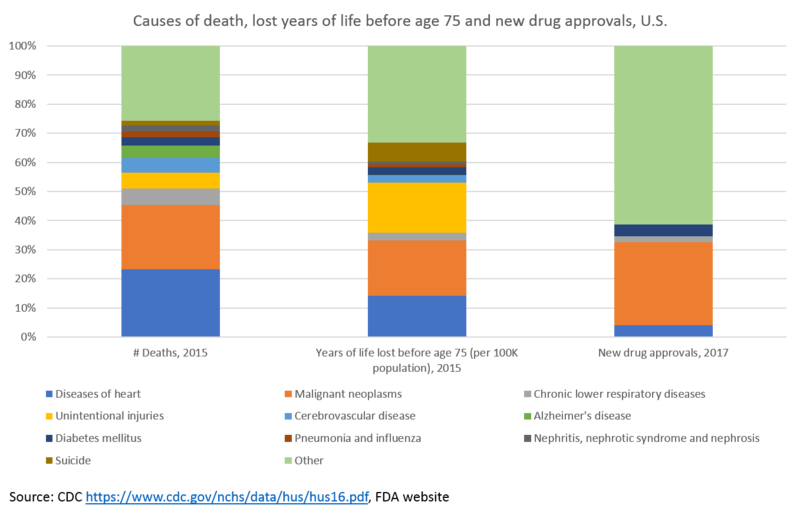 These are both areas where development costs and timelines are short (FDA has made it easier to quickly develop drugs for these areas of severe unmet need) and pricing power is high (drugs that save lives are valuable). Of course, there is plenty of value for drugs that save lives from cardiovascular disease and diseases of the brain, but the FDA has not been as active in supporting faster development processes in these areas (partially because the unmet need is less immediate -- people with cancer are dying today, while people with heart disease may die in the future; and partially because more people have heart disease and psychiatric disease than cancer, and they live longer than cancer patients, so the consequences of an unforeseen severe side effect are greater). While those factors are important, they don't tell the whole story. Perhaps the most important reason for lack of R&D in heart disease and neuropsychiatry is that pharma is a victim of its own success: the "better than the Beatles" problem. The 1990s saw an explosion of new blockbuster drugs to treat cardiovascular disease, depression, anxiety, schizophrenia and other diseases (you may remember the TV ads for Prozac and Lipitor). Since 1980, the number of deaths due to cardiovascular disease in the U.S. has decreased by 17% despite 42% population growth. This is incredible. Some of this is due to better awareness and lifestyle, but much is due to the drugs developed in the 1980s and 1990s. And those drugs are now available for pennies as cheap generics. This success drove massive investment in these areas. However, little of this investment bore fruit. We were reaching the limits of our ability to develop drugs for these conditions: we either didn't understand the biology, or couldn't do much to significantly modify the disease biology with our biochemistry toolkit. And since we had a lot of cheap generic drugs that work pretty well, incremental innovation doesn't work -- because you get only an incremental pricing premium. Investing $1B to get a drug to market and only charging $0.75 per pill compared to a $0.50 generic isn't a profitable model. To succeed as a business, you need high prices to justify high R&D costs, and to get high prices you need to offer dramatically more clinical value than the competition. Turns out that this is really hard. To revitalize research and innovation in some of the most harmful disease areas, we need technological innovation. We will likely need dramatic breakthroughs in biology or chemistry to move the needle (breakthroughs on the scale of what immuno-oncology research for cancer R&D). However, more modest breakthroughs in software, hardware or data analysis can potentially have significant impact -- we simply haven't tried as much of this yet, so low-hanging fruit may still be out there. Takeaway: research into novel treatments for most of the worst diseases affecting our society have been all but abandoned by pharma. The technical challenges are huge -- advances will require stepwise improvements in biology, chemistry or technology -- but these are huge white spaces. The above chart from a widely cited paper is a good starting point for understanding the drug development process. Understanding the basics of this process is crucial to understanding the opportunity in biopharma. I wrote a separate post to describe the drug development process in (hopefully) understandable terms, as I think it merits its own post. If you aren't familiar with drug dev, I'd recommend reading that before continuing (it's a shorter post than this one). Takeaway: most of the cost of drug development is the cost of failure. If you've read my post about the drug development process, you can skip the first four paragraphs of this section and start at "Understanding that the majority of cost..."
If you add up the costs in the "Cost per WIP per Phase" line in Figure 6, you only get about $265M. 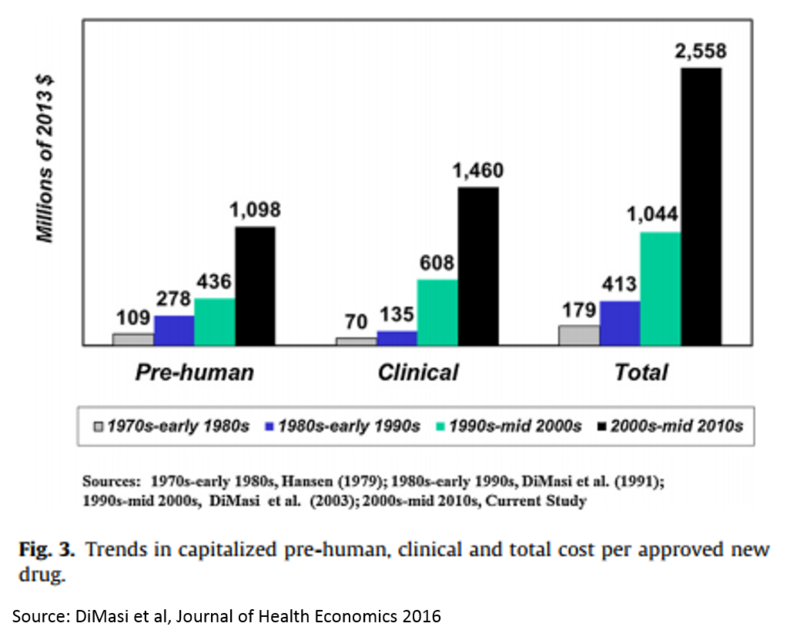 But the total cost on the bottom-right is $1.8B (remember, these are 2010 figures, and today's figures are higher due to inflation but mostly Eroom's Law; the most recent estimate from Tufts is $2.6B / approved drug). So where does this $1.5B in "hidden" cost come from? P(TS) Phase 2: the probability that a drug succeeds in a Phase 2 study. Phase 2 studies are usually the first studies to robustly test whether a drug works in humans. Preclinical studies test whether drugs work in animal models, or in the lab, but these studies are very poor predictors of whether drugs will work in humans. Phase 1 studies generally just test which doses are safe to use in humans to inform the design of later stage studies. So you have to invest a lot of money just to get to the point where you are really testing whether your product works. P(TS) Phase 3: Phase 3 studies are basically larger confirmatory studies that a drug works and is safe. As you can see, the probability of success is much higher than Phase 2 (which explains why the probability of success in Phase 2 is a bigger cost driver), but Phase 3 studies are more expensive. 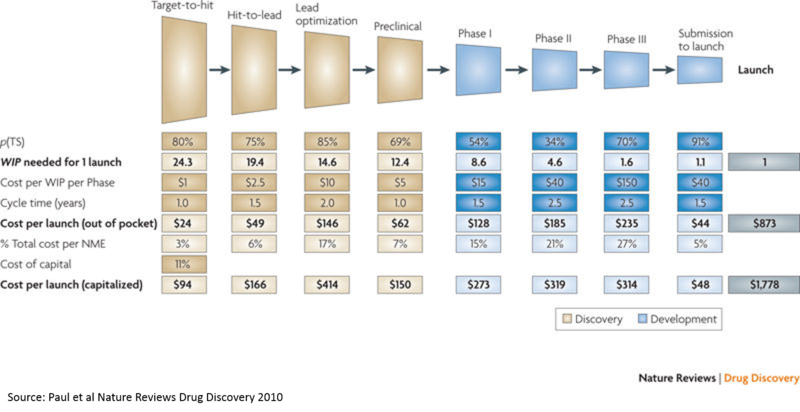 Cost: lead optimization: This is the process where you take a molecule that seems like it works in the simplest lab models, but doesn’t really have what it takes to be a drug. It may be toxic, or its activity may be very nonspecific (so it works against the molecule of interest to a disease, but also messes with a lot of other molecules that could impact healthy function), or it just may be really hard to manufacture at a consistent level of quality. This chemistry work is incredibly time consuming and costly. Note that high throughput screening (target to hit) is at the very bottom. “Expanding the funnel” or filtering better at the very top doesn’t really move the needle. This is important, as many of the initial applications of AI in drug discovery relate to “virtual screens” that operate at this stage of the process. While using AI at this stage is appealing because there is a lot of data and the analysis is more tractable, adding the most value from a drug development perspective would require solving tougher, but more valuable, problems (again, it is easier to start a hard company than an easy company). If you can make a dent in the problem of Phase 2 and 3 failure, it will be so valuable that it will more than make up for the high cost and technical complexity. Strategies that lower the cost of lead optimization may be a better middle ground: not as technically complex, but still very valuable. 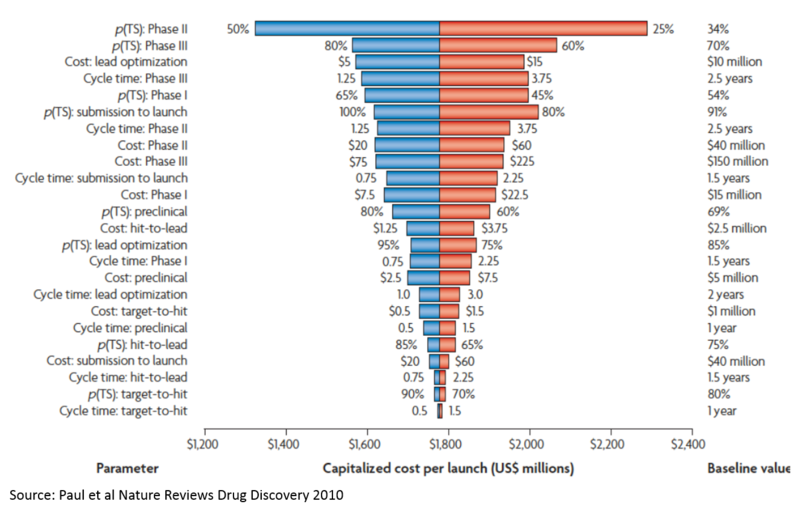 Understanding that the majority of cost and risk lies in Phase 2 and 3 failure also partially explains why developing your own drugs is the best business model in bio (VCs at least think so, investing more in drug development companies than all other life sci companies combined). Anything before Phase 1, and especially anything in the discovery stage, is so risky that it isn't that valuable. So if your product makes screening more efficient, or you license an assay but don't own the compounds, you are fighting for a small share of a small pie. The companies that take products through the riskiest phase of development (and own the IP on the products) capture by far the most value. I will pause here and link to a really great summary of a really great paper for contextualizing where we should invest to improve drug development. The gist of the paper is that we've seen an exponential increase in the cost of drug development despite massive improvements in efficiency at key steps of the drug development process. Their conclusion is basically that the disease models we are using are poor predictors of whether drugs work, so massive increases in efficiency just yield a lot more not-so-great data. In other words, the real bottleneck is biology, not technology. A provocative conclusion is that a 0.1 absolute change in the correlation coefficient between a disease model's results and clinical outcomes in man can offset 10-100x improvements in efficiency of executing the disease models. That's why the best biotech VCs are laser-focused on biology. Accuracy is more important than efficiency. A better understanding of the biology and translational science (moving with confidence from animal models to human studies) generates better returns than investing in improving efficiency of screening. So things like automated, high throughput labs, or AI-driven virtual screening of millions of compounds, may not really help that much if your understanding of biology and disease models aren't great. So if you are starting a bio company, think really hard about the biology, and talk to as many smart researchers as you can to make sure you aren't missing anything. Takeaways: the biggest driver of the high cost of failure is the poor predictive power of our preclinical models combined with the high cost to get to real proof of concept in Phase 2. Better biology is more important than better efficiency / throughput. Drug companies are so much more valuable than other business models largely because they own the core IP through the biggest risk point (Phase 2 human proof of concept), so they get the biggest reward. This is sort of the elephant in the room when it comes to traditional drug discovery. Our current drug development toolbox basically consists of two tools: small molecules and large molecules. These have been the only tools we’ve had for decades. We can only develop drugs that hit one target molecule at a time (maybe a few more with new tech), and we can only target molecules whose chemical structure contains certain chemical motifs. This obviously limits our ability to treat diseases caused by multiple molecules and pathways. We’ve been spending billions of dollars each year exploiting these tools for decades, and, as one would suspect, the low hanging fruit is long-since picked. The recent biopharma wave has expanded the bottom-left of the chart by uncovering novel disease biology that is susceptible to existing small molecule or biologics technologies, or growing the bottom-right circle with new chemistry (like drugging hard-to-drug targets). Specifically, better understanding of our immune system's role in cancer, more focus on biology of previously unexplored rare diseases (incentivized by FDA), and massive amounts of genomic information driven by lower-cost sequencing have opened up new areas of biology and attracted record levels of investment. However, soon enough this low-hanging fruit will be gone as well. Entrepreneurs and investors will continue to scour academic labs to identify chemically tractable biologic breakthroughs, but there is an emergent set of technologies focused on expanding our therapeutic toolkit beyond small molecules and biologics: cell therapy (CAR-T, autologous TCR, stem cell therapy, red blood cell therapy, etc. ), oligonucleotide / gene therapy (mRNA, siRNA, CRISPR, DNA origami, etc), microbiome therapies, bioelectronic medicines and digital therapies. Big pharma companies don't have huge advantages in these areas, so these types of technologies are ripe for startups. Big pharma companies would rather wait until a startup works out the kinks of a new platform and buy them for a large amount than take the risks themselves. 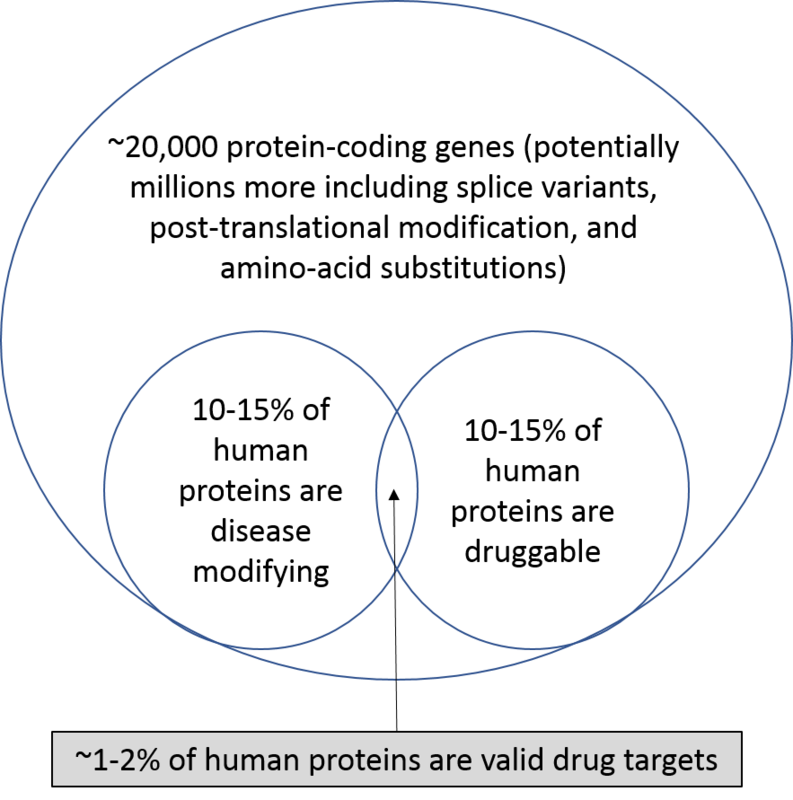 Takeaway: nearly all of the drug development industry is focused on 1-6% of proteins. The industry needs massive technological breakthroughs, and startups are ideally positioned to generate these breakthroughs. For a discussion of opportunities for startups in this space, see part 2 of this post. 1 To briefly summarize the importance of PCSK9: researchers identified people with very rare mutations in a gene called PCKS9. Some patients had mutations that decreased PCSK9's function that were associated with incredibly low cholesterol levels and protection from cardiovascular disease, and some patients had a different mutation that increased PCSK9's function that was associated with high cholesterol levels. This is really compelling evidence that a drug that blocks PCSK9 will lower cholesterol in humans, and potentially protect from cardiovascular events as well. For more on PCSK9, here is a great overview from Robert Plenge at Celgene, and here are some more good and informative articles and papers. 2 The chart uses FDA approvals to represent investment in R&D. This is of course imperfect, but it is the easiest to measure, as FDA keeps records of this and the number of drugs is small enough (46) that manually analyzing the data is easy. If you look at other metrics like disease areas that receive venture funding or get acquired by pharma, or pharma R&D spend by indication, the same indications come out on top (cancer and rare disease). See here for some discussion of that. 3 My back of the envelope math is 30M people in the U.S. with rare disease, 50% of whom are children, 30% of whom die before age 5, so 4.5M people in the U.S. who die before age 5 due to rare disease. Assume these children die at an average age of two, so lose 72.5 years of life before age 75. 4.5M deaths * 72.5 years / death = 326M years lost before age 75. In 2015 that number was only 176M for diabetes.